23 March, which was two days ago, is a very significant day for Ahmadiyya Community. This is the day the Divine promise made to the Holy Prophet (peace and blessings of Allah be on him) was fulfilled and his prophecy came true and the second phase/renaissance of Islam began. God gave permission to Hazrat Mirza Ghulam Ahmad of Qadian (on whom be peace) to announce that he was the Promised Messiah and Mahdi. He was to re-established Unity of God with proofs and reasoning, prove the superiority of Islam over all other world religions and instil hearts with love of the final [law-bearing] Prophet (peace and blessings of Allah be on him). We are indeed fortunate that we are included in the Community of the Promised Messiah (on whom be peace). In light of the significance of the day, two days ago, Promised Messiah Day was commemorated in the Jama’at by holding conventions. While objectives of the advent of the Promised Messiah (on whom be peace) were explained in these conventions alongside how he established the Community, people also gave thanks for being enabled to accept the Promised Messiah in obeying the instruction of the Holy Prophet (peace and blessings of Allah be on him) and thus take his greetings to the Messiah. We should be mindful that while it is joyous that we have accepted the Promised Messiah (on whom be peace) it also increases our responsibilities, which we need to pay attention to and discharge of. What are these responsibilities? They are to further the cause for which the advent of the Promised Messiah (on whom be peace) took place so that we may be included in those who, having accepted the Promised Messiah (on whom be peace), were to make new heavens and new earth. What were the objective of the advent of the Promised Messiah and how much have we understood them, practice them and what are we doing to spread these objective? The Promised Messiah (on whom be peace) said that God commissioned him to remove the ill-will that had come between God and man and to re-establish a connection of love, to eradicate religious wars, to make evident the verities of faith that were hidden from the world, to present a model of spirituality which was weighed under selfish, worldly darkness, to illustrate Divine powers which manifest in human beings through practice and not simply through words and above all to once again plant the sapling of luminous Oneness of God among people. He said all this was going to come to pass via God’s power. Now it is the task of the Promised Messiah’s followers to show the world the beauties of the living faith of Islam. It is our great obligation to enhance and strengthen our connection with God. To inform he world that with the advent of the Messiah, religious wars have come to an end and now it is the true and ardent devotee of the Holy Prophet (peace and blessings of Allah be on him) alone who can make the Ummah one and who has come in the mantle of the Prophet. In order to make these verities evident we have to demonstrate good role-models and models of spirituality and remove selfishness and explain to the world that God speaks to His people even today. We have to tell the world that God is One and everything on the earth is mortal and will perish save God and our permanence is in connecting to Him. The Promised Messiah (on whom be peace) said that the objective of his advent was only the revival of Islam. He said do not consider that I have brought any new religious law (shariah) or any new Book. He said such thoughts were extremely erroneous and misguided. He said no new shariah could come because it was finalised through the Holy Prophet and the Holy Qur’an was the seal of all Books. However, it was true that the blessings and beneficence of the Holy Prophet (peace and blessings of Allah be on him) and the guidance of the Holy Qur’an was to remain fresh in every age and it was as a proof of these blessings and beneficence that God had commissioned him. He spoke of the weak and fragile condition of Islam during which God had sent him for its support and guardianship and in accordance with His promise: ‘Verily, We Ourself have sent down this Exhortation, and most surely, We will be its Guardian.’ (15:10) The Promised Messiah (on whom be peace) said when did Islam need guardianship and support if not at the time of his advent? He said the situation at his time was akin to the time of the Battle of Badr about which God states: ‘And Allah hadalready helped you at Badr when you were weak…’ (3:124) The Promised Messiah (on whom be peace) said this verse carries a prophecy that when in the fourteenth century Islam will be in a weak state, in accordance with His promise, God will help Islam. The Promised Messiah (on whom be peace) said there were two objective of his advent; to establish Muslims on righteousness and purity so that they become such true Muslims as God has willed in the connotation of the word Muslim. And for the Christians his advent was to remove the doctrine of the cross and to diminish the artificial god created by the Christians so that the world may completely forget him and only the One True God may be worshipped. He said the toxins of the foul reactions of his opponents in light of his objectives were going to ruin them as God states: ‘…Certainly Allah guides not one who is a transgressor, and a liar.’ (40:29). Thus God deals with liars accordingly but what is done for the majesty of God and for the blessings of His Prophet is safeguarded by angels. If this mission was a worldly business God would obliterate it but if it was from God, and most certainly it was from God, then angels would protect it. The Promised Messiah (on whom be peace) said it has never been that a Prophet or Khalifa of God came to this world and the world accepted him quietly. Hazrat Khalifatul Masih said that the attacks carried out in the name of Islam do not support Islam but bring it in disrepute. Killing innocent people causes displeasure of God. Those who carried out the recent killing of innocent souls in Belgium, the terrorist atrocity, killing dozens of innocents and injuring hundreds can never attain God’s pleasure The Promised Messiah (on who be peace) has made is explicitly clear that in this age fighting for the sake of religion is forbidden and it garners God’s displeasure. No one can say that this message has not reached everyone that fighting for religion is now forbidden. May God give sense to those who are Muslims but commit atrocities, be they groups or governments. May they pay heed to the voice of the Imam of the age and desist from committing atrocities and use the real weapon of this age which has been granted to the Promised Messiah (on whom be peace). The Promised Messiah (on whom be peace) said that now the need is to use the pen and not the sword (force). 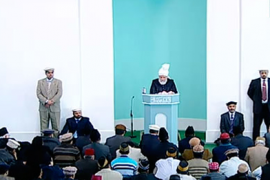 He said our opponents have attacked the true faith of Islam by means of various sciences. He said this had inspired him to use his writing prowess in the arena of sciences and demonstrate the miracle of Islamic spiritual valour. He said how it could be possible for him to do so without the grace of God, Who wanted His faith defended by the Promised Messiah. The Promised Messiah (on whom be peace) said that reality is only what Islam brought. He said he believed that even if there was to be no Gospels or the Qur’an or Scriptures of other Prophets of God, Oneness of God would have still been proven because its signs/traces are to be found in human nature. To suggest that God had a son is to suggest that God would meet death because a son is an heir to carry on one’s lineage. If Jesus is the son of God, the question would arise is God to die? In short in this creed of theirs Christians have had no regard for God or any appreciation of human faculties and have held beliefs which do not carry heavenly light in them. It is a distinction of Islam that in every age it has had corroborative signs, just as God has not deprived it in this age. The Promised Messiah said God ad sent him me to demonstrate the truth of Islam to the world. He said blessed is he who comes to me in search of the truth and blessed is he who then accepts it. The Promised Messiah (on whom be peace) said that the Qur’an gives definitive knowledge of Jesus (on whom be peace) coming down from the cross alive. In the thousand years (preceding him) while Islam faced many calamities, this matter was also lost on Muslims and the erroneous creed entered among them that Jesus was raised alive to the heavens and he will descend down to earth near to the Day of Judgement. However, he said that God commissioned him in to remove the erroneous beliefs that had crept among Muslims and to demonstrate the truth of Islam to the world. He said he was to expose the reality behind other false religions, in particular eliminate the doctrine of the cross which was an impediment to spiritual development of man. The Promised Messiah (on whom be peace) said even if other reasons for the need of the advent of the Messiah were to be left aside, as regards Islam’s similarity with the Mosaic dispensation, there is need for his advent. Jesus came 1400 years after Moses (on whom be peace). The Promised Messiah (on whom be peace) said this example that he was presenting was that of someone coming as a reflection of a Prophet of God, however, those who claim that Jesus is to return himself in person should also present an example which most certainly they cannot. And if they cannot present an example then why do they engage in new-fangled ideas? The Promised Messiah said such ideas should be avoided because they lead to ruin. The Jews incurred Divine wrath because they rejected a Prophet of God and this was because they considered something metaphorical to be real. A similar situation exists now. The Promised Messiah (on whom be peace) said that although the Muslims of today had the example of earlier Jews before them, they still did not understand. The Promised Messiah (on whom be peace) said there are four signs of his truthfulness. The first was his miraculous linguistic skills in Arabic, second acceptance of his countless prayers, third sign was that of his prophecies and the fourth sign was that the spiritual verities and knowledge of the Holy Qur’an were disclosed to him. The Promised Messiah (on whom be peace) said: ‘I have been sent in the same way as he who was sent after Mosesas, and whose soul was raised to heaven having endured all kinds of trials in the reign of Herod. Hazrat Khalifatul Masih said: Recently in light of 23 March Ahmadis sent each other messages of felicitations (Mubarak) on their phones as it is done these days through Whatsapp. If these message of felicitations were sent with the intention that having accepted the Promised Messiah (on whom be peace) they had joined those Muslims who are guided and are helpers of faith, then certainly they were justified in sending the messages of felicitations, there was nothing wrong doing so and it was not a harmful innovation. I was amazed that one person sent a message in the form of a letter to the people who were sending each other messages of felicitations reprimanding them at what they were doing and opining that by doing so they would be embroiled in harmful innovations like the rest of Muslims. It is amazing how could this person, who I think has religious knowledge and also knows how the administration of the Jama’at works, tell people that they would be embroiled in harmful innovations! The rest of the Muslims do not have the blessing of Khilafat, which Ahmadis have by virtue of accepting the Promised Messiah (on whom be peace). If something wrong or a harmful innovation is seen to be developing and if the Khilafat is rightful and just, it will put a stop to it. It should also be borne in mind that one should not be doubtful and keep the [hadith] in view that deeds are judged by motives. This person should have made his point remaining behind the shield of Khilafat. Do not try to overstep the footsteps of Khilafat. Whoever will do so, will slip up. This should be remembered. Unity should be maintained and no efforts should be made to impose any personal preferences on the Jama’at. I will give an example of such matters, this was not such a big issue but what was the Promised Messiah’s (on whom be peace) viewpoint on some harmful innovations that Muslims follow! The Promised Messiah was asked a question about Qaza e Umri, Salat which is offered on the Farewell Friday to make up for previous missed Salat. He replied: It is a frivolous matters However, once a man was offering Salat out of time during the era of Hazrat Ali (may Allah be pleased with him). A man asked Hazrat Ali why did he not stop the man? Hazrat Ali (may Allah be pleased with him) replied he was fearful lest he came under the verse: ‘Hast thou seen him who forbids’ (96:10). Of course if someone abandons Salat with the thought that he will offer Qaza e Umri, he is wrong but if he is offering it out of regret then let him, why do you stop him? After all he is praying. That said, such a person lacks courage. You see, you may also come under the verse if you stop him. Thus so cautious were those who had the right to pass edicts but this person is warning people who are sending each other messages of felicitations and is passing edicts. If he had something on his mind he should have written to me. If something needs to be stopped it is the responsibility of the Khalifa of the time to do so through the administration of the Jama’at. May God enable everyone to understand the objectives of the advent of the Promised Messiah (on whom be peace) and enable them to put them in practice. Three funeral Prayers were announced, two present and one in absentia. Mehmooda Saadi Sahiba passed away on 22 March at the age of 94. Nur ud Din Chiragh Sahib passed away at the age of 45. Syeda Mubaraka Begum Sahiba passed away on 20 March at the age of 83.